In the Slavonic tradition, because monastic clergy wear dark colour cassocks (usually black, dark blue, or dark brown) and married clergy wear whatever color cassocks they have (often lighter colors), they’re referred to as black clergy and white clergy. Also, the color of sleeve lining of the ryassa [outer cassock] signified the rank of the priest. In modern Ukraine, the clergy use dark colors for riassas, using other colors only for under cassocks. They no longer use colored sleeve linings to denote rank. The practice of wearing colored cassocks comes from the times called Turkocracia, the Turkish rule, or ‘Turkish yoke’. Moslem clergy reserved the right to wear white or black thinking to humiliate the Christian clergy by forcing them to wear bright colored clothing. Once the Greek Church was free of Turkish rule, they dropped the practice of wearing colored cassocks. But the Ukrainian clergy had copied the practice of the Greek clergy and it had become part of the Ukrainian style. By the way, Greek-tradition clergy wear colour under-cassocks in the tropical and equatorial climes. Cream, gray, and tan are popular. Also, blue under-cassocks are not uncommon (no matter what climate zone). It is proper to wear a belt on the under-cassock. In the Greek tradition, the belt’s no more than a ribbon or cord tied around the waist. But in the Serbian and Romanian Churches, these belts signify the rank of the priest. Wearing the under- and outer-cassocks is common to bishops, priests, deacons, monks and nuns. Permission to wear a cassock is often given to seminarians, monastic novices, and sub-deacons and readers in parishes. As for vestments, when the Typikon says anything about them at all, it only specifies ‘light’ or ‘dark’ vestments, so local tradition is the only ‘standard’. In the Orthodox Church, six liturgical colors are used: white, green, purple, red, blue, and gold. Later, black vestments also came into use, however they are coniderd to be a Western Influence and were never fully accepted into the Orthodox liturgical practice. In some places, scarlet orange or rust color is used as well. You could assign meanings to the different colors: white for the pure light of God’s energy; green, the color of life, for the Holy Spirit and the wood of the cross; purple for the suffering of Christ; deep red for the blood on the Cross, blood of the martyrs; blue for the Mother of God; and gold for the richness of the gifts of the Holy Spirit, and bright red for the fiery flame of the Spiritual Host. Black is traditionally the color of death and mourning in the West, but in the far East white is the color of death and mourning. None of this is written down in the rules, and different colors obviously have different meanings for different peoples. It is therefore easier to describe various customs than it is to say what are ‘proper’ and ‘improper’ colors to use. Below, we give the most common uses for colors in the Orthodox Church, especially in the Eastern Slavic tradition. 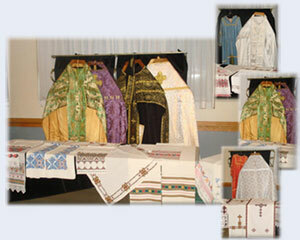 The most important Feasts of the Orthodox Church and the sacred events for which specific colors of vestments have been established, can be united into six basic groups. The group of feasts and days commemorating Our Lord Jesus Christ, the Prophets, the Apostles and the Holy Hierarchs. Vestment color: Gold (yellow) of all shades. The group of feasts and days commemorating the Most Holy Mother of God, the Bodiless Powers and Virgins. Vestment color: Light blue and white. The group of feasts and days commemorating the Cross of Our Lord. Vestment color: Purple or dark red. The group of feasts and days commemorating monastic saints, ascetics and fools for Christ. Vestment color: Green. The Entrance of Our Lord into Jerusalem (Palm Sunday), Holy Trinity Day (Pentecost) and Holy Spirit Day (Monday after Pentecost) are, as a rule, celebrated in green vestments of all shades. During the Lenten periods, the vestment colors are: Dark blue, purple, dark green and dark red. This last color is used essentially for the days of Great Lent. On Sundays and Feast days of this period, the vestments are of a dark color with gold or colored ornaments. Funerals, as a rule, are done in white vestments. In earlier times, there were no black vestments in the Orthodox Church, although the everyday clothing of the clergy, especially the monastics, was black. In ancient times, both in the Greek and in the Slavic Churches, the clergy wore, according to the Typikon, "Crimson Vestments": dark (blood) red vestments. In Russia, it was first proposed to the clergy of Saint Petersburg to wear black vestments, if possible, to participate in the Funeral of Emperor Peter II . From that time on, black vestments became customary for funerals and the weekday services of Great Lent. White is worn for the feasts and post-feasts of Epiphany, Transfiguration, and Pascha. In antiquity, Christmas and Epiphany were celebrated as one feast, Theophany of the Lord, so, in some places, white is worn on Christmas day, but gold is worn from the second day of Christmas until Epiphany. In Ukrainian custom, the Church and the vestments of the priest are changed to white at the prokeimenon of the Holy Saturday Liturgy. And then white is worn until the end of Paschal Season. In some places in Ukraine, white is worn from Ascension to Pentecost, but in other places, gold is worn for those days. In Carpatho-Ruthenian style, in the Paschal season, white, exclusively, is worn. White, the color of the Resurrection is worn at funerals and memorial services. Also, interestingly, in Eastern Ukraine, at Liturgy on Holy Thursday, a white altar cover is used to represent the linen tablecloth of the Last Supper [the priest wears dark red, and the church remains in black until after the liturgy, when the priest’s vestments return to purple or dark red]. Green is worn for Pentecost and its post-feast, feasts of prophets, and angels. In some places, green is worn for the Elevation of the Cross in September. In Carpatho-Ruthenian practice, green is worn from Pentecost until the Saints Peter and Paul fast. Green is often worn for Palm Sunday. Gold is worn from Christmas to Epiphany, and in some places, during the Nativity fast. Gold is worn when no other color is specified. In one tradition, gold is worn on all Sundays (except when white is worn), including even the Sundays in all the fasting periods. In Carpatho-Ruthenian style, gold is worn from the eve of Ascension to the eve of Pentecost. Red, especially dark red or ‘blood red’, is worn for the Saints Peter and Paul fast, the Nativity fast, Elevation of the Cross (Sept 15), and for all feasts of martyrs. Bright red would be worn for Saints Peter and Paul feast, and for the Angels. On Mount Athos, and at Jerusalem, bright red is worn on Pascha [after Matins] and on the Nativity. Blue is worn for all feasts of the Virgin, Presentation of the Lord, Annunciation, and sometimes on the fifth Friday of Lent (Akathist). In Carpatho-Ruthenian parishes, blue is worn for the Dormition fast and feast, and then is worn until the Elevation of the Cross, sometimes even until the Nativity fast. Purple is worn on weekends of Lent (black is worn weekdays). In some places, purple is worn on weekdays of Lent (gold on weekends). Black is worn for weekdays in Lent, especially the first week of Lent and in Holy Week. In Carpatho-Ruthenian, formerly Uniate parishes, black is worn on all weekdays for funerals and memorial services and liturgies, as is done in the Roman Catholic Church, though this is not universally true any more. Orange or rust is worn in some places for the Saints Peter and Paul fast, and in other places for Saints Peter and Paul feast through the Transfiguration. Please note that ‘feast’ refers to the period from the vigil of the feast until it’s apodosis, or ‘putting away,’ usually called the ‘post-feast’. The lengths of these post-feasts vary and are given in the Liturgical Calendar and Rubrics. Generally speaking, there is a post-feast of about a week for each of the twelve major feasts. As you can see, there is great variety in ways of doing things. In the Western Church, six colors are used: white, red, rose, green, purple and black. Blue and gold are not used. Black is worn on Good Friday, and at requiem masses. In many parishes the covering on the altar and other tables, other cloths and hangings, the curtain behind the Royal Doors, and even the glass containers for the vigil candles are changed to the liturgical color of the season.